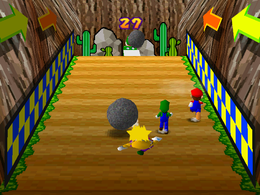 Boulder Ball is a 1-vs-3 player minigame found in Mario Party 3. Three players try to climb a slope while the other player is a machine flinging boulders at them in an attempt to block their path. If squished by a boulder, the squished player is stunned and slides down the hill. If one of the three players reaches the top of the hill, they all win, but if the other player manages to keep the players from going on top of the hill, that player wins. Game Rules – "Use the machine at the summit to roll boulders down the slope and prevent the other 3 players from climbing up." Advice – "Knocking multiple players down at once is the key. As you're dropping the boulder, try bouncing it off the walls." French Rocher Danger! Rock Danger! This page was last edited on November 9, 2017, at 17:55.